Push notifications are an excellent strategy to capture all your wasted traffic and get them interested in what you have to offer. That’s because you get not only push subscribers, but also email subscribers – from pages that aren’t doing anything for you. In today’s “15-Minute Sprint”, I was able to set up a push campaign inside OptinLabs, made it live on our WordPress frontend, and then launched a few autoresponder emails taking our total autoresponder count to twelve. You have all these wasted pages. By wasted pages, I mean pages that don’t have a clear call-to-action and are not capturing leads already. So ‘push notifications’ is a sneaky way of capturing leads on every single page of your website. 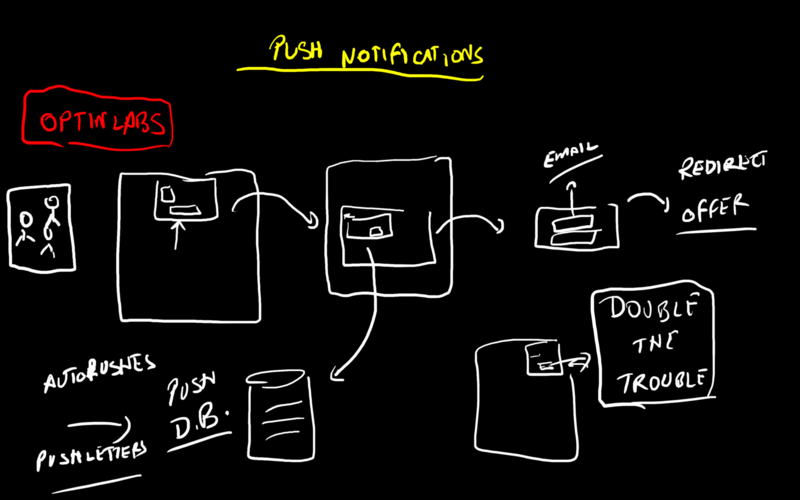 Setting up a push campaign is super easy inside OptinLabs. You can customize and design the popup that asks people to subscribe to push notifications, connect your existing autoresponder account, and even set up AUTOPUSHES. Autopushes are the equivalent of autoresponders. After a visitor subscribes for push notifications, they are immediately asked to enter their email address too. Set up the push campaign. Install the code and activate the popup on your wasted pages. All of this takes a few minutes and you have yourself YET ANOTHER optin funnel. Let’s get real for a bit. Today, I needed to set up some autoresponders too. Cause we already have people who opted in on DAY #1 who’re almost done with their Day #9 autoresponder. So we needed a few more autoresponders promoting OptinLabs. I need you to understand the power of shared knowledge. When you find a helpful resource – if it’s actionable and your business can benefit from it – you take that knowledge and build on it. 10 years of experience and thousands of emails written – but still I just prefer to copy what’s working. I’m still learning new things every day. I’m investing time, money, and energy into my education and self-improvement. If you’re reading this blog post and following my Bizathon Challenge – that’s exactly what you’re doing as well. If you’re not part of Inbox Blueprint 2.0, then do your business and YOURSELF a favour, and join I.B. You also get the PRO version of OptinLabs + OL Academy along with Inbox Blueprint when you buy from here.